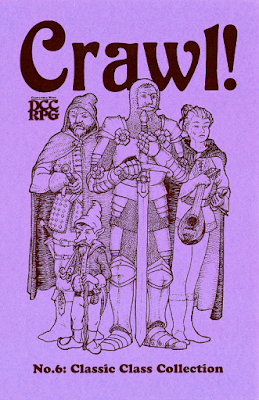 Crawl! fanzine #6 is written by Jose Lira, Yves Larochelle, Raskal, and Colin Chapman, and published by Straycouches Press. This issue is the "Classic Class Collection", and within we will find four new classes and a modification to the core Thief class. Disclaimer: I have another illustration in this issue. You are a storyteller, a jester, a clown, an orator, a singer, the greatest of all performers! Designed by Jose Lira, this bard is similar to that we've grown accustomed to from 2nd Edition Advanced Dungeons & Dragons onward.The "Talent Check" is a good innovation, taking a bit from Mighty Deeds and a bit from Spell Checks to rank the bard's performance. Yves Larochelle gives us a gnome class which includes a new spell, Scripted Illusion. These gnomes are closer to the 1st Edition AD&D gnomes than those we see in Pathfinder, etc. They are more folkloric tricksters, and are certainly not tinker gnomes. They only gain five class levels, which is actually a nice limitation, in my opinion. Jose Lira's version of the paladin allows for paladins of any alignment. Other than that, they feel pretty Old School. There is a section on Fallen Paladins which may warm the heart of anyone who grew up on 1st Edition AD&D. This is the class I did an illustration for. This is Raskal's take on the wilderness warrior epitomized by Aragorn and Robin Hood. This class seems to take a simplified 3rd Edition D&D ranger as its inspiration. Finally, Colin Chapman breaks down the Thief class skills so that you can customize what your thief is particularly good at.